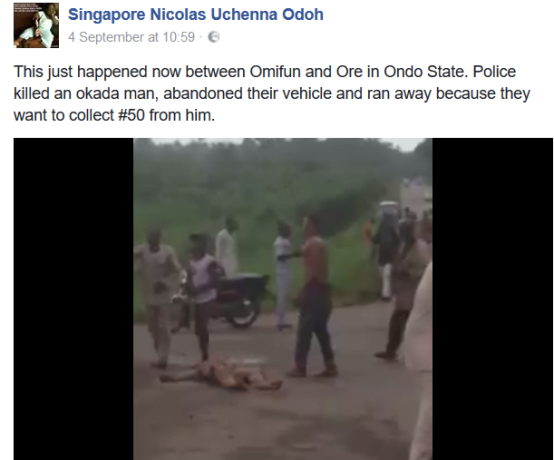 On Sunday morning Sept. 4th, a police officer in Ondo State shot dead a commercial motorcyclist at Omifun on the Benin-Ore Expressway in the state. The body of the unidentified motorcyclist has since been deposited at a hospital morgue in Ore. The source alleged that a bribe-seeking police officer 'attached to the anti-crime patrol unit of the Ondo State Police Command' shot and killed the okada man for allegedly refusing to give him a bribe of N50, and immediately fled the scene with his colleagues. Watch the video immediately after the killing below..